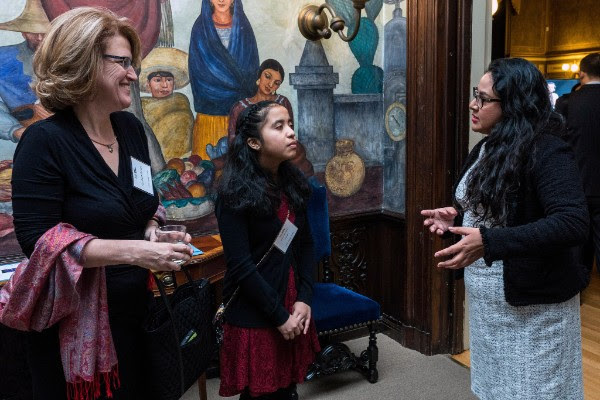 Mónica Martínez Lopez (right), Educational Liaison with the Mexican Cultural Institute greets Maria (center) and Marybeth Haneline (left) of Nova Labs at the Global Leadership Reception, February 2, 2018. Photography by Ricky Bowden, Prime Media Solutions. The Olympics are the inspiration for the FIRST Global robotics challenge for youth to be hosted this summer in Mexico City, following the inaugural competition this past summer in Washington D.C. at DAR Constitution Hall. Nova Labs volunteers provided critical support over the past year at the enormous undertaking for the new venture. This February, youth leadership from Nova Labs were special guests together with dignitaries from around the world welcoming Mexico as the host country for 2018. Introducing youth leadership to enriching experiences is one of the most rewarding aspects of my volunteer work. Just as FIRST Global anticipates new possibilities with their move to Mexico City, Maker Faire NoVa welcomes a new host partnership this year. 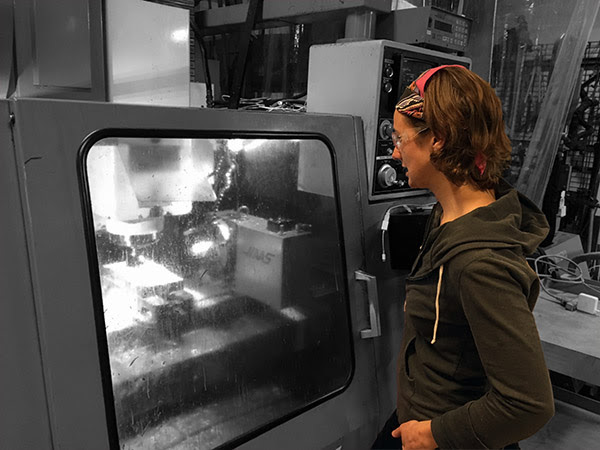 Nearly two years ago, the Maker Faire NoVa steering committee recognized the value of forging new host partnerships for the Maker Faire and began exploring options. This March, that vision is realized as Maker Faire NoVa is proudly hosted in partnership with George Mason University at the George Mason campus. We are indebted to the all-volunteer team led by co-producers Jeanne Loveland and Carl Hutzler for this significantly elevated production. Special thanks to the second lieutenants who lead major areas: Sara Bradley, Todd Snedden, Taylor Sweeney, Asma Chaudhary, Margaret Kositch, and Brian Jacoby. Rediscover the Joy of Making at Maker Faire NoVa at George Mason University on Sunday, March 18! Maker Faire Nova Tickets are on sale now and are available at a discount before March 14th. This month, the board welcomes Doug Newton as our new Metal Shop Steward and we congratulate Mike Hogarty on his new role as Entrepreneur Team Lead. This new position gives focus to one of Nova Labs’ key missions – the support and promotion of entrepreneurship. As we move toward improving Nova Labs’ infrastructure, the board is currently reviewing proposals for upgraded, business-class Internet service. Nova Labs currently utilizes consumer-class Internet which no longer meets the needs of our growing community. This upgrade will allow for a constant, stable Internet connection – a key component to our technology-heavy maker space. The board is also working closely with our TechComm team lead, John Hoskins, to analyze current options for upgrading our website infrastructure to allow for a better user experience – and eventually, more robust billing options. Additionally, we continue to develop and define roles and responsibilities for the key functional areas of our maker space. This process allows us to define areas where the maker space requires a leadership position from within the community. Current examples of this are the Steward Team Lead and the Entrepreneur Team Lead positions. 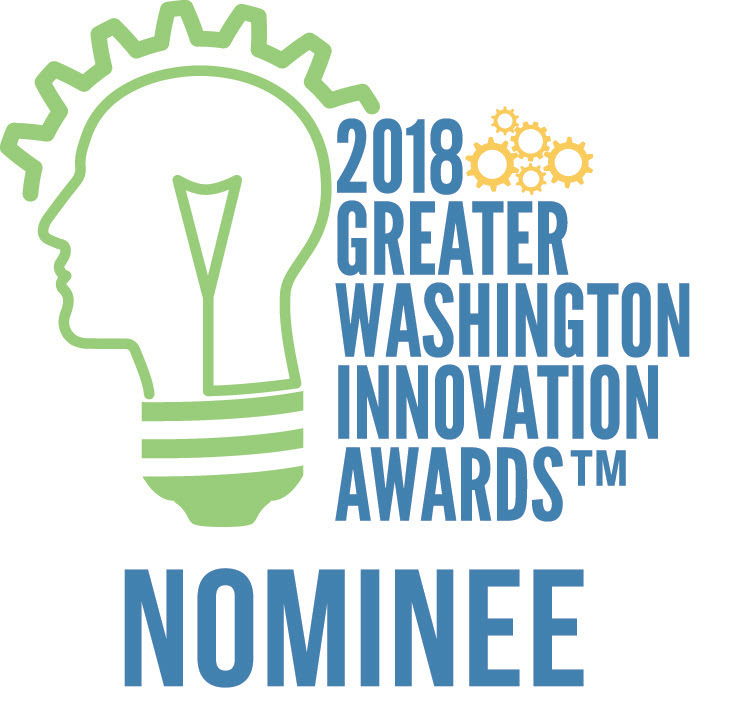 Nova Labs is honored to be among the nominees for the Northern Virginia Chamber of Commerce, Greater Washington Innovation Awards Showcase 2018 – Community Impact Innovator of the Year!!! Congratulations to our maker community! 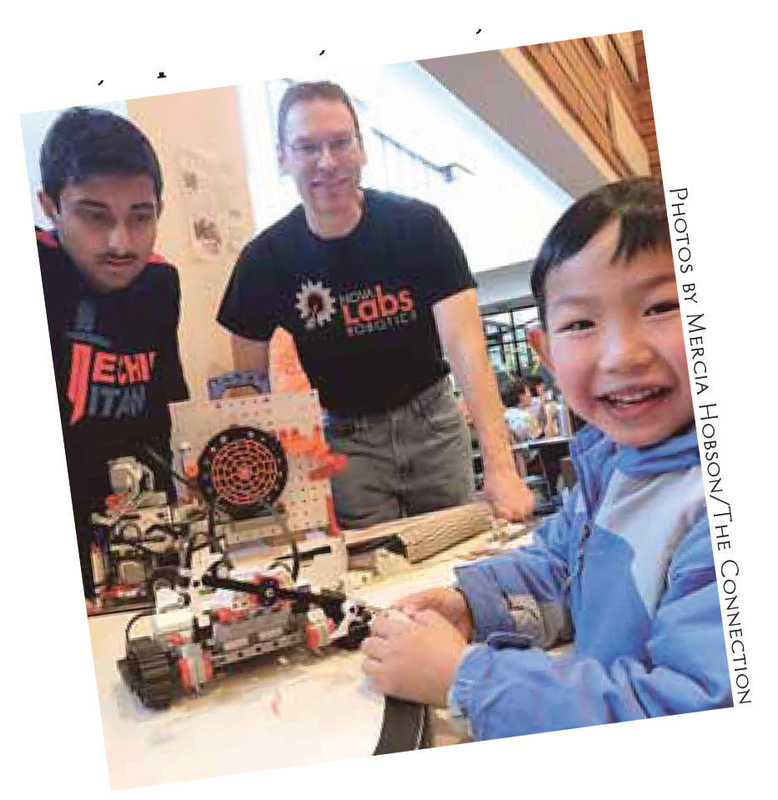 >Reprinted from “Maker Faire Gets Bigger & Better” by Merica Hobson in the Reston Connection, 14-20 February, 2018. >Reprinted from “Reston Camp Expo Draws Nearly 500 People” by Merica Hobson in the Reston Connection, 21 Jan – 6 Feb, 2018. More information on Nova Labs Robotics Summer Camps found here. You could be forgiven for not knowing about Maker Faire Nova. Perhaps you’re new to the area or to Nova Labs. This is the Nova Labs community’s signature event of the year celebrating the diversity of makers and interests at Nova Labs, throughout the extended NOVA area, and in the larger expanse where other makers and makerspaces are found in Virginia, DC, and Maryland. Nova Labs members organize Maker Faire NoVa, participate as makers or maker teams, and staff by volunteering. This culminates an almost-year-round planning cycle led by co-producers Carl Hutzler and Jeanne Loveland. Maker Faire NoVa 2018 is at George Mason University, Fairfax this year as we have well and truly outgrown our previous location. There is ample onsite parking for makers, volunteers, and attendees. The organizing team is now stepping into high gear with some of the logistics operations starting to pre-stage material at GMU, layout and mapping, and communication to makers and volunteers. Now at approximately 130 makers (or maker teams), there is such an interesting range of interests represented this year. 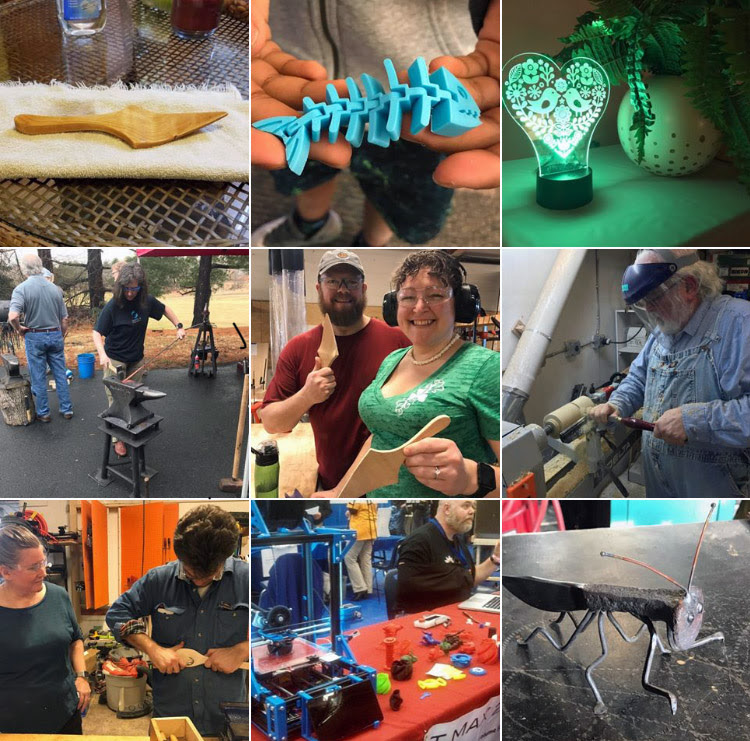 All the makers are listed at http://nova.makerfaire.com/makers-exhibitors-2018/ and are being featured on social networking as part of the outreach effort. There will be a team of GMU scientists fielding questions from the public. You will know them by their “Ask a Scientist” t-shirts. If you know folks that are still unsure about Area 51, vaccinations, whether we actually went to the moon, or climate change, see them. Separately, NASA will have an exhibit which was located specifically for its advantage in proximity to a loading dock (must be big!). We are ahead of schedule in terms of volunteer staffing, but there are still a few slots left. Go to http://nova.makerfaire.com/volunteer/ to sign up for a slot or two. Volunteers get a free ticket and volunteer t-shirt, and our heartfelt thanks. If you have some time, we always seem to need help afterwards straightening up and packing away stuff. If you have questions about Maker Faire NoVa or someone asks you about it, try looking at http://nova.makerfaire.com. You could be a hero in your office, neighborhood, place of worship, or civic organization by introducing your friends to Maker Faire NoVa that first time. Just point them at http://nova.makerfaire.com/tickets/ to get tickets. If you still have questions, direct them to contact@makerfairenova.com. Our sponsors list has grown (https://www.nova-labs.org/sponsors/) and they really help make this event happen: Google, the Innovation Fund of the Community Foundation of Northern Virginia, Fairfax City EDA, Forcewave, Northern Virginia Chamber of Commerce, EAI Technologies, and Fairfax County Library Foundation, just to name a few. As in previous years, there is a pre-Maker Faire NoVa gathering of makers on March 14th. This Maker Celebration is sponsored by Fairfax City Economic Development Authority and is for makers exhibiting at the Faire and Sponsors. Makers should have received a specific invitation based on their Call for Makers submission. Often they may not get a chance to mingle and discuss their projects because they’re busy showing, demonstrating, or answering questions on the day of the Faire. This is also a chance for makers to get their maker ID badges, parking information, T-shirts (if they arrange for them in advance), and location. Makers will also have an opportunity to talk with some of the Faire sponsors. The Faire committee thanks you for your cooperation for this event. We are very excited to have Theo Nazz back at Maker Faire NoVa this year! 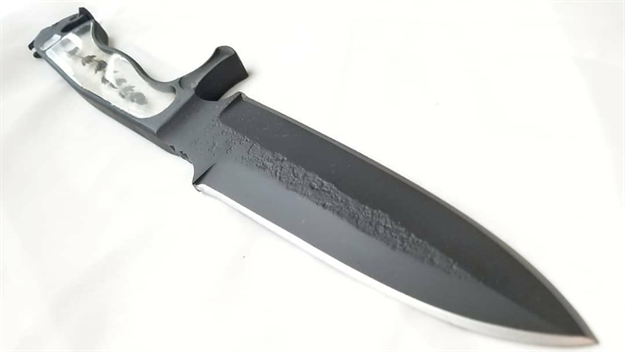 Theo is also raffling off a custom forged knife from his collection. Buy a raffle ticket online now (through March 18, 2018) or at the Faire and we will pull a random winner the day after. All proceeds donated to Nova Labs. 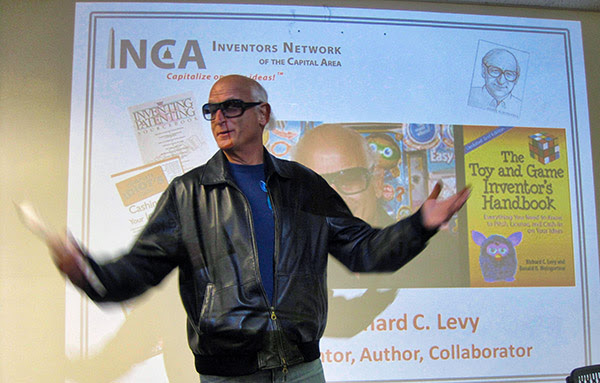 Nova Labs and Inventors Network of the Capitol Area (INCA) welcomed Mr. Richard Levy on February 13. With over 30 design & utility patents, and over 12 books, including “Toy & Game Inventors Handbook,” Richard is a world recognized expert. Through stories of his trials and tribulations as an inventor, he shared the key factors of his success, and how he has successfully licensed his products to companies including Hasbro, Mattel, General Mills, P&G. Nova Labs incubators, Callye Keen and Mike Hogarty of Red Blue Collective, had the opportunity to speak with Mr. Levy after his presentation. Candles, fine wine, golden forks, romantic music, and… blacksmithing? That’s how we do Valentine’s Day at Nova Labs! For the first time ever, Nova Labs hosted “Makesperience” to celebrate Valentine’s Day. Couples came to take a class of their choice to spend time together, learn something new, and enjoy a romantic dinner to top it off. 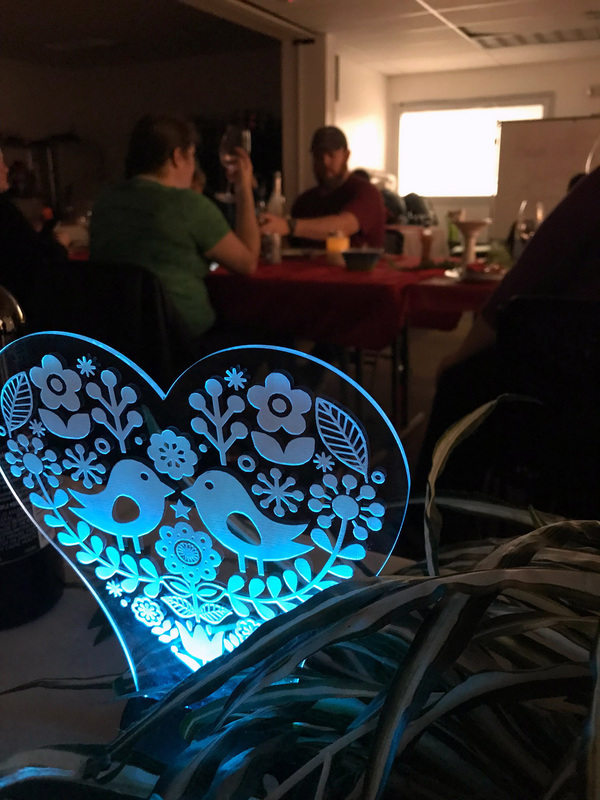 During class and dinner, participants deepened their connection with their significant other as well as made new connections with other makers. After the couples took their chosen class, they entered the classroom for dinner. The atmosphere of the classroom was transformed to a romantic restaurant where people could celebrate their love for each other and for making. Décor was added to give a more romantic vibe, but all the tools remained. Married maker couple Joshua and Lauren Capehart attended the event. Joshua notes, “The space still felt like a makerspace, which is a good thing.” Members also gave Makesperience some finishing touches by providing real china and fine wine for the dinner. Makesperience provided couples with a truly unique Valentine’s Day experience that did not compromise on romance and kitsch. Jennyfer Peterson came up with the idea for this event as an alternative to going to an over-crowded, expensive restaurant. This would give couples a chance to connect in a creative way and spend time making something together. Patrick Waters, better known as the “Woodshop Cowboy,” taught one of the Makesperience classes, Woodworking in the Kitchen. “I wanted them to have… time together [and] skills learned,” says Patrick, who is most proud of his corny power ballad soundtrack he played in his class. Perhaps one of the best parts of Makesperience was that the participants were a mix of new attendees and long-time Associate and Key members. The new attendees were warmly welcomed by Nova Labs more seasoned makers. As always, everyone excitedly collaborated about their ideas and projects. While talking to other makers is a daily occurrence at Nova Labs, for the first time people could talk about making as a couple to other couples in a romantic setting. For some couples, making is at the forefront of their relationship for much of the time. This is not the case for every couple, however, and Makesperience gave couples a chance to connect through making, for both experienced and new makers. Valentine’s Day 2018 was quite special at Nova Labs this year, thanks to Makesperience. 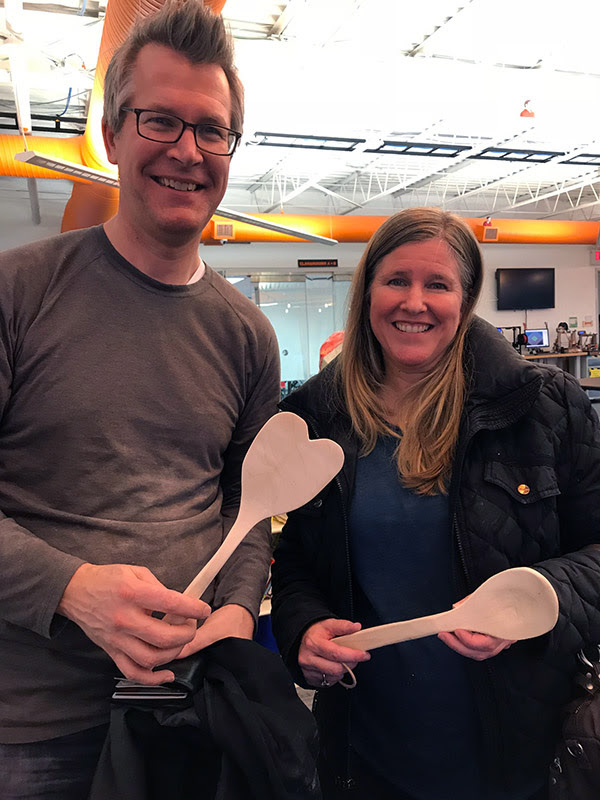 Some couples got to make something together for the first time, while other couples added to their repertoire of projects. Time spent together is priceless, and spending that time at Nova Labs makes it that much better. Especially when the classroom is lit with nothing but candles and has slow, romantic music playing in the background. See you and your significant other at Makesperience 2019! Nova Labs continues to grow and evolve. The many challenges are a daunting task for the volunteer core. The operational arm of Nova Labs handles the things members and associates interact with. We fondly refer to these people as our Stewards. As Stewards, the responsibilities and roles abound. Everyone has their personal touch. On the other hand, Stewards need to know what is happening on a global scale. A forum was needed to get our Stewards to sit down and talk about all things Nova Labs. 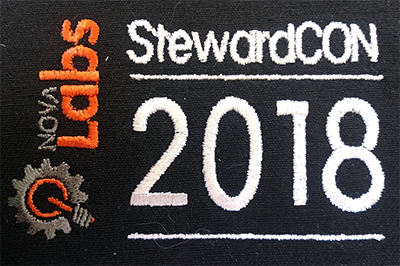 From this, StewardCon 2018 was born. The Stewards discussed finances, resources, roles, and a few other topics while enjoying a nice home-cooked meal. The Nova Labs Stewards hope to keep the dialog going on a quarterly basis. Team RhinoHawk will be developing and flying a huge drone to compete in the UAV Challenge Outback 2018 competition. They are looking for dedicated enthusiasts in the areas of structures, electronics, software, and media content to join them. Theo Nazz won The History Channel’s Forged in Fire twice and lived to tell about it. Come hear what he learned about competition, publicity, and how his win affected him as an entrepreneur. Speaker Idalia Friedson is a Research Associate and Project Manager at Hudson Institute, where she works on issues relating to national security, including cybersecurity and technology, defense strategy, and energy. She will discuss HQI’s recent work and broad policy goals as well as the plan for Hudson’s upcoming conference to set standards for quantum communication networks. Nova Labs is on Instagram! Follow @nova-labs for the latest photos of events and projects. Tag @nova-labs in photos of your Nova Labs made projects to be showcased on our account! Maker Faire NoVa also has an account! Follow @makerfairenova for all the latest happenings on the upcoming Maker Faire NoVa. Are you a ‘Young Entrepreneur’ under the age of 25? Do you know a Young Entrepreneur? Around Reston Magazine is establishing a new feature segment that will share the story of one Reston/Herndon ‘Young Entrepreneur’ per issue. Currently Around Reston is accepting stories for consideration. This is a great opportunity for some lucky entrepreneur to get maximum exposure in front of 60,000 local readers! Please send your short story about you and your product/services to Around Reston, info@aroundreston.com. Feel free to include why you feel you are a best candidate! Be sure to mention you read about it in the Nova Labs Newsletter! My name is Olivia Morgan. I operate my own industrial design and product fabrication business. My mission is to help inventors with cool ideas get their products to market. In addition to my clients’ projects, I develop my own designs. I am so grateful to be a new member of Nova Labs and be able to use this space to complete some of this work. One of my products currently in development is Mag.Net. 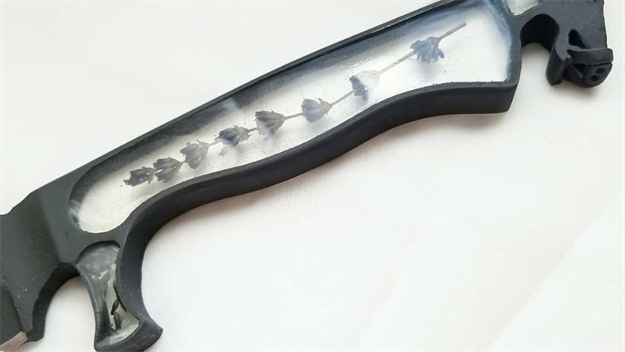 It is a flexible, organically shaped net that uses earth-magnets to mount to any magnetic surface. You may have seen some prototype versions hanging around Nova Labs. Originally conceived for use in kitchen storage, it’s use has expanded to a variety of applications. More information is available at http://eepurl.com/dhoblz. Please feel free to join my mailing-list to become eligible for free Mag.Net prototypes. Before becoming a product designer, I was a model shop manager for ZGF Architects, one of the largest architectural firms in the US. With three years experience, I moved on in order to expand and diversify my fabrication and design skills. 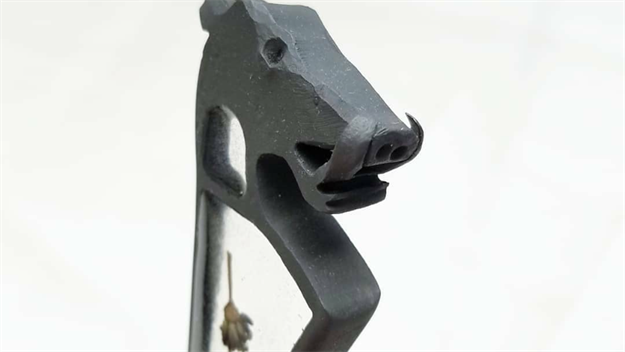 I became involved with Nova Labs in September 2017 when I got the amazing opportunity to learn the concepts of metal milling with Mike Hogarty. Working here has been a significant source of inspiration for me. I am so happy to be a part of a community so enthusiastic about learning and teaching fabrication skills to others! I will be showcasing Mag.Net at the Maker Faire NoVa 2018 on March 18 at George Mason University. More of my own work can be found at oliviacmorgan.com.